Eco-innovation Cumbria is a support programme to help small and medium sized businesses (SMEs) improve efficiency, grow capacity and develop new solutions for industry. The programme helps SMEs to increase innovation in low carbon technologies and encourage their adoption. Through research and innovation and the development of higher level skills, it enables businesses to grow capability in developing new products and markets, enhancing the growth of the low carbon and environmental goods sector within Cumbria. 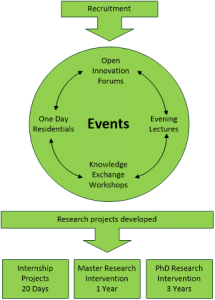 Eco-Innovation Cumbria offers a variety of free workshops and events around Cumbria to explore innovation challenges, plus collaborative research projects between the University partners and SMEs. This is a 4-year project funded by the European Regional Development Fund. It is led by the University of Cumbria partnering with Lancaster University and the University of Central Lancashire and is available to ERDF eligible businesses. The Growth Hub has been fantastic in supporting our business and helping to drive growth.